Gaëtan is what I would call a 'typical dance fanatic', meant in a positive sense of course. 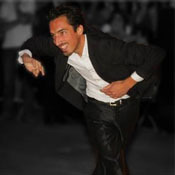 He teaches without problem (and at a high level) salsa on1, on2, chacha, bachata, tango ... He creates shows, for himself and for groups. He started teaching to small groups of other fanatics, which you can still feel somehow in his teaching: he'd like to take you far, to teach you everything ... Other forte's are body movement, technique in general and styling (both men's and ladies' styling by the way).